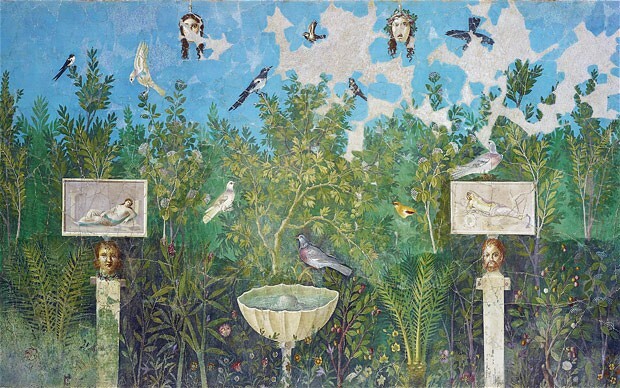 A large house or villa might have several gardens including an elite viridarium – a place of greenery, often large – as seen in the House of the Faun or the Vettii or a more prosaic, courtyard hortus as seen in the House of the Surgeon, the House of the Golden Amorini or the House of the Silver Wedding. Whether with or without a colonnaded peristyle, Gardens were not confined to the rich. Many simpler houses had a smaller inner garden, a xystus (“garden walk” or green terrace) with a few trees like cypress, laurel or fig and “framing” plants like boxwood or herbs like rosemary, saffron and thyme to be used for the kitchen or similar functions. 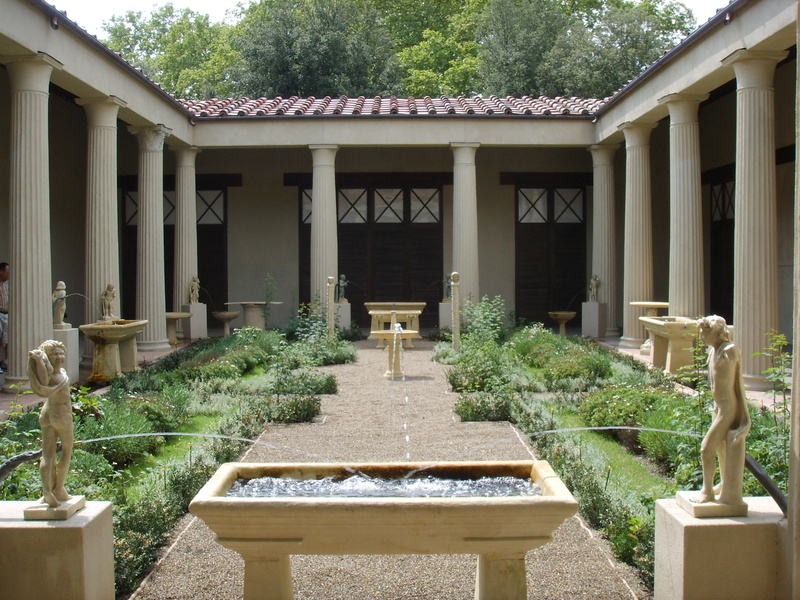 These Pompeian gardens differed greatly not only in size, design, function and plantings, but also with respect to the role of water, sculpture and garden furniture. In the famous garden of The House of Decimus Octavius Quartio (also known as the House of Loreius Tiburtinus), there was an extensive water system that included pools, and channels used as a cooling backdrop for the outdoor dining area, and then also an extensive watercourse running the length of the large garden. Pergolas for vines can also be seen at the above House of Loreius Tiburtinus. Ornamental fountains and spouts made of bronze and marble came in many shapes and sizes. There were elegant and simple basins. Water sprayed from the mouth of a peacock, a rabbit and many mythological creatures. Not all fountains were made of stone or bronze. Several spouts were found that were made in a bluish glazed pottery like material known as faience, including the crocodile and the frog. Faience ornaments were made in Egypt, an indicator of the thriving trading circles of the time. In addition to the status of these elements, they also add an element of playfulness and humor to the garden’s area of rest, play and beauty. Other ornamental and even philosophic elements were added via sculpture. Even oscilla ornaments suspended on garlands between columns added garden decoration. Formal gardens of the elite in Pompeii feature many practical and beautiful objects in addition to fountains, including beautiful benches and bronze and marble sculpture. The sculptures were usually statues of gods, poets, philosophers, and historical figures typically from the Greek world. One of the most interesting and memorable aspects of the Pompeii gardens was their common use of painted murals (wallpaintings are often frescoes) as a backdrop on the walls behind. They are often gorgeous focal points that draw the eye and transport the viewer to perhaps another place and time. Sometimes they also extended the view, making the garden feel larger. “The strongest impression given by Roman wall painting when seen on the spot at Pompeii is an unexpected lavishness. After the reserve of the street façade, the painted interiors had a palatial air, all the most striking for the sparseness of the furnishings; and beyond in the courtyard, more bright, bold scenes and decorations stretched round the walls behind the colonnade; although now broken and faded, these must have been splendidly effective when fresh and seen in combination with garden, fountains, statuary, sunlight and people.”  Sometimes these wall paintings are even of imaginary gardens. A number of the paintings show their intense interest in nature – especially surrounded by urban life – as well as historic events set in landscapes. Particularly memorable are the large paintings that often plaster the whole back walls of garden areas. Traces of the painted foliage and other garden features on the wall of one home, merges the real and imaginary. Sometimes a painted fence, fountain, fish, birds, often too large for the actual garden, would be painted. These paintings can also contain information about what plants and animals might have populated ancient gardens. Some were idealized and intended only as fantasy; that does not diminish their beauty or lessen their impact but instead underscores the sophistication of Roman aesthetics. The many gardens of Pompeii had never been fully studied botanically until the work of Wilhelmina Jashemski in the 1960’s and 1970’s. Jashemski, was a Maryland professor of ancient history and a Pompeian archeologist, who helped establish the academic field of garden archaeology. Although Roman law was her specialty, she was interested in Roman gardens, in part because she was a gardener herself. (Her own home was surrounded by hundreds of azaleas and other flowering plants and trees.) She made plaster casts of root cavities to identify plants, examined soil contours to reveal planting beds and irrigation channels, and analyzed floral and faunal remains. 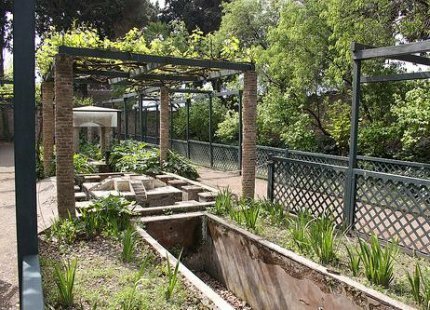 She discovered that gardens were an integral part of everyday life in the ancient town and with a bit of green space, families could grow figs, olives, cherries and other fruits and vegetables. The range of plants that could be grown with success increased dramatically with time and the increase in water availability. “Formal gardens were essentially green gardens, planted with evergreens beautiful year round: laurel, acanthus, myrtle, oleander, box, ivy and rosemary.”  This strikes me as very similar to what we plan in our Mediterranean gardens, in a similar climate here on the Newport Beach California Coast today. These gardens usually had carefully arranged geometric flowerbeds, and footpaths running in between them. The beds were bordered with fences made of reed, and were planted with cypress bushes and roses, with other ornamental and flowering plants along the edges. Perhaps even a few onions, herbs and cabbages were tucked in between the formality. Flowers in season added accent such as roses, lilies and violets. Many gardens, less formal in nature, were planted with trees (hazel, fig and peach) and vines and herbs. 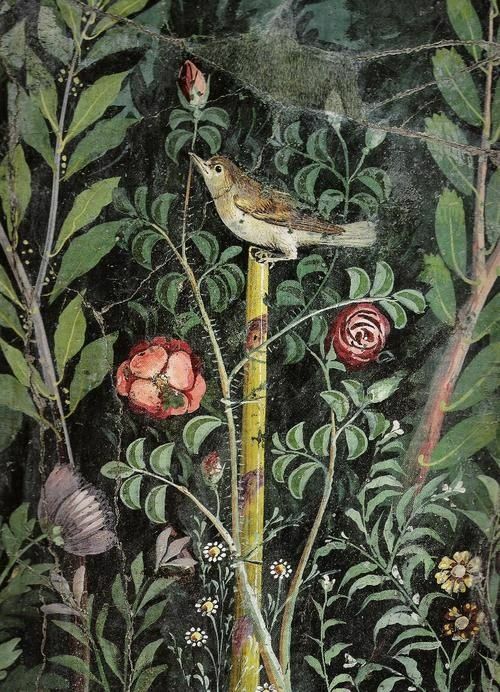 “Some plant species we recognize as ornamental also represented a sort of ”home pharmacy“; Wormwood, Juniper, Roses and the garland plants, which were used to make wreaths for the gods, were also medicinal plants.”  Ancient Pompeii was apparently famous for it’s flower culture, as it still is today: commercial growers produce cut flowers and seed. “In antiquity, flowers were grown for making garlands and perfume or ointment.”  Sometimes these gardens were also the homes of small pets including the popular turtle, dog and doves. Paul Roberts, Life and Death in Pompeii and Herculaneum. Oxford University Press. 2013, 148. Patrick Hunt, “Pompeii”, Ten Discoveries That Rewrote History. Penguin/Plume, 2007, 113, 129; Patrick Hunt, “Persian Paradise Gardens: Eden and Beyond as Chart-Bagh” in Gifts of Persia, July 11, 2011, Garden Conservancy Event at Ebell Center, Los Angeles, Electrum Magazine, July, 2011. Joe Holley, “Pompeian Historian Wilhemina Jashemski,” Washington Post. Monday, January 12, 2008. J. J. Dobbins and Pedar Foss, The World of Pompeii. Routledge, 2008, 496. Mary Beard. The Fires of Vesuvius: Pompeii Lost and Found. The Belknap Press of Harvard University. 2008, 87. Marisa Ranieri Panetta, Pompeii: The History, Life and Art of the Buried City. White Star Publishers. 2004, 310.